Pakistan have reached number 1 in the test rankings for the first time since the current rankings system came into place. It is a feat never achieved by a test team from Pakistan and one that should be cherished by every single one of Pakistan’s fans. A definite cause for celebration. For Misbah, this is one hell of an achievement considering how he started his tenure as captain in 2010. What a phenomenal rise it has been from those murky depths 6 years ago. Recently Pakistan celebrated their test win at Lord's with a celebratory salute as a tribute to the Pakistan army. Now, we all salute Misbah and his men for reaching the top of the pile in test cricket. It has been quite a journey for Pakistan over the past few years during which they have achieved a lot as a team, as well as, individually. Here's a look at what the team, its captain, and its players have achieved since November 2010, when Misbah took over as captain. Pakistan's test team has the second best W:L ratio in the world, after South Africa, in tests played since November 2010. 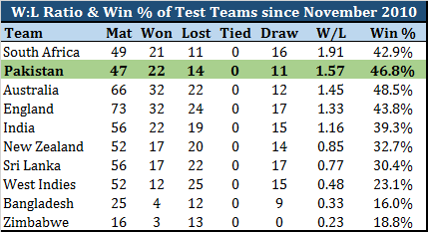 They also have the second best Win % in tests in this period, behind only Australia. They are unbeaten in the UAE during this period where they have beaten Sri Lanka, England, Australia, West Indies, and drawn against South Africa and New Zealand. They are also unbeaten in test series played since August 2014; the only team that has not lost a test series in this 2-year period. Their series wins also include clean sweeps over England and Australia, with the latter their first series win over Australia after 2 decades. During this period, Pakistan were also involved on two record run chases, both against Sri Lanka. The first came in Sharjah when they chased a target of 300 odd in under two sessions completing a successful run chase with the highest run rate ever. The second was a mammoth chase of 382, in Pallakelle, their highest ever and the 5th highest in the world. Pakistan is the only team in the world with 5 batsmen in the Top 20 of ICC's Rankings for Test Batsmen. No other team has more than 3 batsmen in the Top 20. No words are enough to praise Misbah for the way he has marshaled his troops over the past 6 years. He has led from the front and has been an example for everyone on the test circuit. 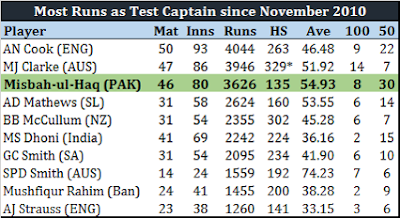 During his reign, he has notched up 22 test victories, an unprecedented number for a Pakistan captain. He is well past the previous Pakistan record of 14 test wins shared by Imran Khan and Javed Miandad. Misbah has also surpassed Javed Miandad, Inzamam Ul Haq, and Imran Khan to become the leading run scorer as a captain in tests for Pakistan. He also broke Inzamam's record of most test centuries as Pakistan captain when he notched up his 8th hundred as captain at Lord's earlier this summer. Best test captain Pakistan has had? Best captain in the world currently? 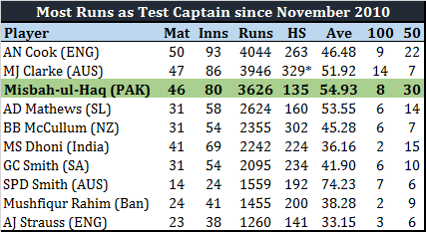 In terms of runs scored by captains in tests since November 2010, Misbah is at number three, behind Alastair Cook and Michael Clarke, however his average of 54.93 is second best, behind only Steve Smith. He also has the third most number of centuries as captain during this period. During this successful period under Misbah, Younis Khan has been an instrumental figure guiding Pakistan's rock solid batting in tests. He stood tall in that record run chase against Sri Lanka, his double hundred secured a series leveling win against England at the Oval, and his partnerships with Misbah, Azhar, Asad, Shan, and several others led them to many a test ton. During this period, Younis broke all national batting records by going past Mohammad Yousuf, Inzamam Ul Haq, and Javed Miandad to become the leading run scorer for Pakistan in tests, as well as, the leading century maker for Pakistan in tests. He now has 32 test tons, 7 more than Inzamam's record of 25! There are not enough words and numbers in this world that will do justice to what Younis Khan has achieved and done for Pakistan over the past 6 years. For the many records that he has broken and created, it is probably best that you read my previous posts here and here. For now, I leave you with the leading run scorers in test cricket since November 2010. While he is the 5th highest run scorer during this period, he has the second best average, behind Steve Smith, and he has the joint highest number of centuries with Alastair Cook and David Warner. Azhar Ali has been a vital cog in Pakistan's test batting line up and has been extremely successful in his role at number 3. He has been so good at that position that he is already the second highest run scorer at number 3 for Pakistan, behind only Younis Khan. Azhar has played many a match winning century for Pakistan over the past 6 years. During this period, he is among the only 4 batsmen in this world who have scored over 3,000 runs and made at least 10 centuries while batting at 3. The most technically correct batsman produced by Pakistan, Asad is also the most under rated. Number 6 is a peculiar position to bat on consistently, considering that one gets to bat in such varied situations all the time. At times, one comes into bat with the team in a difficult situation with 4 down for very little; at others there is a huge score on the board and one has to be aggressive. More often than not, the number 6 batsman gets to bat with the tail, and many a times one finds themselves running out of partners. Most teams do not even have set regular number 6 batsman. Records indicate that there aren't many batsmen in this world who have consistently batted at number 6 with success. 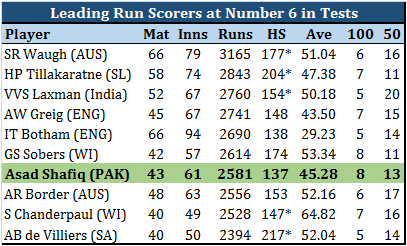 Asad Shafiq, however, is an exception, who has made number 6 his very own. He has played such a significant role for Pakistan at number 6 and has contributed immensely to the strong positions Pakistan has held in test matches over the past 6 years. Asad's 8 centuries at the position is a record he shares with the legendary Sir Gary Sobers. He would have broken that record had he remained in that position for the 4th test at the Oval. It is likely that his stint at 6 is over and he is set for a permanent move to number 3, however for the past 6 years he has owned the number 6 position like no other batsman ever. Pakistan have never had a better wicketkeeper batsman. 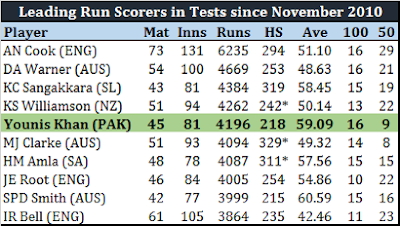 The impact that Sarfaraz has had for Pakistan at number 7 is equivalent to the impact that Adam Gilchrist had for Australia. He is a busy player who keeps the scoreboard ticking, always gets runs, and always gets them fast. He has the ability to take the game away from the opposition within a session and he showed that when he played that crucial innings during the record run chase against Sri Lanka in Sharjah. 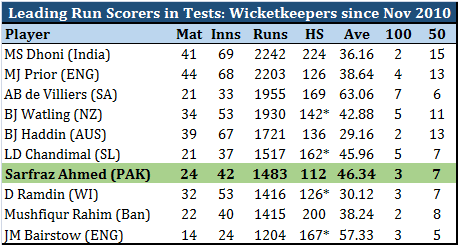 Sarfaraz is 4th on the list among Pakistani wicketkeepers in terms of test runs and 3rd on the list for most centuries by a Pakistan wicketkeeper. 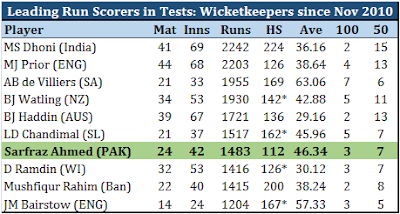 However, his average of 43.8 is the highest ever for a Pakistan wicketkeeper who has batted in at least 10 innings. Since November 2010, he is 7th on the list of wicketkeepers with the most runs in tests; however his average of 46 is surpassed by only AB De Villiers and Johnny Bairstow. Pakistan test teams of the past were built around their fast bowling spearheads. From Fazal Mahmood to Imran Khan and Sarfraz Nawaz to Wasim Akram, Waqar Younis, and Shoaib Akhtar, they have all played major roles in guiding Pakistan to historic test victories over the years. So it comes as quite a surprise when one realizes that Pakistan's test victories over the past 6 years have come on the back of their batsmen, as shown above, and their spinners. Saeed Ajmal, Abdur Rehman, Zulfiqar Babar, and Yasir Shah have all played an instrumental role in bewildering opposition batsmen and driving Pakistan to test wins. Three of them are among the leading wicket takers in tests since November 2010. Considering that these records reflect performances over the past 6 years, it is quite an achievement for Yasir Shah to feature in the ranks as his test career is barely 2 years old. Yasir's match winning bowling also earned him a Pakistan record of reaching 50 test wickets in fewer matches than anyone before him. 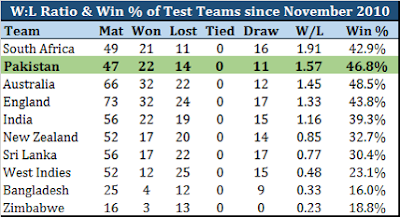 Pakistan has had some great test wins and some quite amazing series wins in the past 6 years. The clean sweep of England in 2012 and the first series win over Australia in 20 years will always remain special. The draw in England this summer was a memorable one as well. The record run chases against Sri Lanka have forever entered the record books. It has all been pretty damn special. Misbah has been an inspirational leader and I don't argue against the people who claim that he is the best test captain Pakistan has ever had. He may not have done for Pakistan cricket what Abdul Hafeez Kardar and Imran Khan did, but what Misbah has managed is also something that no one else before him has ever managed. And it will be quite difficult for any successor to even come close. Unprecedented 22 test wins and that too after taking over a team that had been shattered after being cheated by its own captain and players. Salute hai Misbah ko aur iss team Pakistan ko!